You cannot fully experience love in this life until you know what love is. To "Know Thyself" means to know it at every level, not just your physical and emotional levels. From this foundation you can then truly begin your journey towards a fulfilling relationship with one or many souls. Every single one of you is a perfect being of love within. We are equal and loving beings who hold the potential to share this love with anyone we so choose. This being understood, let's erase a universal mistake in human thinking: "To have love, we must find love." There is no finding love, only expressing love! 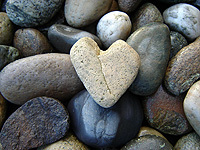 To find love suggests we are currently without it, and this is impossible for we are light beings, which are all love. Let me give you an example of this. We all wake up from time to time and feel happiness or joy at the world (some people feel this all the time, and some once in a lifetime). We bounce out of bed and greet people with more love expressed. Now, we really know the world certainly did not grow more beautiful overnight! What happened is you allowing yourself to let your love flow from within. That is all. Two or more people do not create love, only express it, depending on their own ability to let love flow from within themselves. You cannot create what already exists in its entirety. What appears to be created is really just two people sharing what is already within themselves and the end result is called a relationship. Ịf one is unable to feel love, it is because he or she is blocking what is within them. Then they mistakenly blame the other person for not being lovable or for creating this block. The highest mind shares their inner love and takes responsibility for their own inability to feel that love. Do not confuse unlovable behavior with your own inability to express love. The people around you are always doing unloving behavior for they are not aware of their own inner love to some degree. This is why we were given the ability to have children. For this was as close as many of us would get to dealing with unlovable behavior (not following rules, outbursts, unreasonable behavior, etc.) and still expressing love! We could start to see what the expressing of unconditional love looked like. But you create this same situation in a relationship between adults, and bam, the "love" is seemingly gone. It is never gone, just utterly repressed and blocked. We were also given Spiritual Masters in order to observe their unfettered expression of love: Christ and Buddha are two examples. Their ability simply came from seeing all of us as "children" of God. While they may not love our behavior, they never stop loving us. This is Christ Consciousness love. The reason that the term soul mate is skewed in concept is that people think they can only feel that love with one special person. In fact, they go through life looking for this soul mate and often end it in grave disappointment and reflect this disappointment with less than loving behavior towards their current mate. If we were unfettered with all of our veils, we could love completely anyone. When I go out in public, I do not say, "I will not treat this person with love because they are not my friend, family, or lover." I treat them with the same respect and love as I would my dearest friend, for underneath it all, and at the highest level, they are. If we were to speak of something that feels like a soul mate love, or a split apart, it is generally this: People can spend many lives and dimensions together by choice. Through these lives they start to resonate more closely with each other. A history is created, and deeply seated emotions are built. Each subsequent life, their ties grow stronger and their desire to be with each other builds and it subconsciously returns. Because what we resonate with we attract, we inevitably will be thrown into each other's paths on this plane. Best friends, extremely close siblings, and yes, even your closest lover, are often these people. I refer to these people as being from the same "soul group." Clusters of souls that resonate with each other, and seek their own company over and over. And within these soul groups can be the closest thing to a soul mate, which is two souls holding the highest desire to express their inner love with each other. You could say this is a soul group within a soul group. So remember, you are a being of light comprised of love. To know love is to know thyself. If you seek outside of yourself, it should be to share, not to find.